PU-profiled belts are homogeneously extruded from high-quality raw materials or are subsequently reworked to ensure they match their particular application. 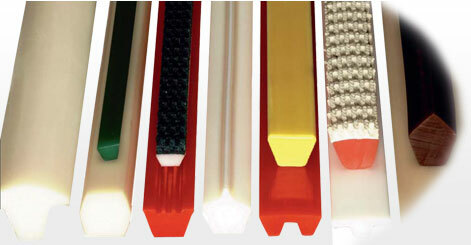 Thanks to specifically decades of experience in processing and treating thermoplastic polyurethane, we designed a production plant that allows us to offer any processing option for standard profiles. The processing options that we can offer, such as notching, milling, grinding, cutting, welding and coating, enable us to create a wide range of nonstandard profiles from existing profiles without the need for new, costly extrusion tools. Spline profiles are primarily notched to reduce the bend radius. It is irrelevant whether these profiles are used for power transmission, conveyor belts, for guiding purposes or as edge profiles. Milling profile backs in particular are adapted to the goods to be conveyed, or recesses are created through longitudinal or transverse milling for a wide range of applications. Here, both coatings and PU profiles are partially processed up to 0.02 mm to the precise thickness or width to achieve maximum running accuracy or particularly uniform, even surfaces for further treatment. Cutting allows flat profiles to be adapted to the desired width, spline profiles to be adjusted to the correct height and width or round profiles to be halved into guides or carriers. 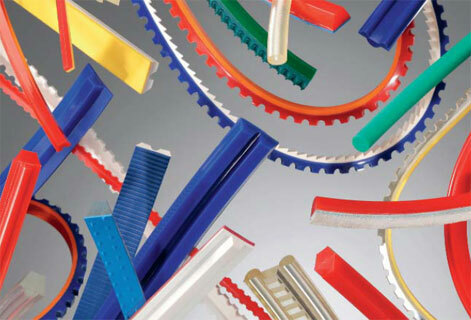 Welding different profiles together enables us to manufacture T-profiles, twin V-belts, parallel V-belts and strip and insertion profiles homogeneously in any size and to apply PU and PVC coatings, guide strips, profiles, edge profiles, fixed links and lifters without the use of an additional bonding agent. The coating of conveyor belts with an even surface enables the belt to be tailored to the goods to be conveyed, thereby guaranteeing reliable transportation and preventing the goods from being damaged. With a range of more than 50 different coatings, we can offer carrier a wide selection that can, of course, be complemented later on with notching, milling or grinding. In this respect, our production range includes numerous FDA/USDA-approved models in accordance with Regulation (EU) No 10/2011. Various hard materials can also be combined within a profile depending on the respective application requirements – something that would otherwise require an elaborate co-extrusion procedure. The ability to process standard profiles together with the corresponding selection of raw materials allows us to offer an almost unlimited range of forms and models. We can even manufacture new, customer-specific high quality profiles quickly and cost-effectively, even in small order. As a result, we are able to manufacture the right profile for virtually any application today – be it a drive, conveying, strip or insertion profile.